Claremont House01263 715779work01603 870304fax Self-cateringThis brilliant Grade II listed house sleeps up to ten guests with five bedrooms. Visitors can enjoy the local beach, or travel a little further to larger, more popular beaches. The local area is renowned for its scenic countryside, the beauty of which permeates everywhere. There are plenty of pursuits to follow within even a local radius, including tennis courts, playgrounds, shops, pubs and restaurants. This property is well-suited to large families and groups. 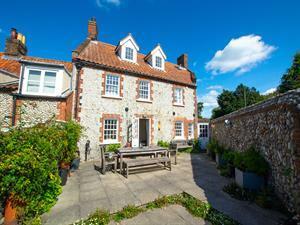 This brilliant Grade II listed house sleeps up to ten guests with five bedrooms. Visitors can enjoy the local beach, or travel a little further to larger, more popular beaches. The local area is renowned for its scenic countryside, the beauty of which permeates everywhere. There are plenty of pursuits to follow within even a local radius, including tennis courts, playgrounds, shops, pubs and restaurants. This property is well-suited to large families and groups.